We are a local charity helping local people to a new start… we need your help! As a friend your support would help us meet the increasing needs of our community. We are a small charity that has to find new ways of sustaining the services we offer. The Furniture Scheme has been supporting people in need in South Shropshire for more than 22 years. The charity formed in 1994, initially to address growing concerns about the amount of waste going to landfill. The Furniture Scheme’s originators came up with the idea that one person’s trash is another person’s treasure and the concept of passing on unwanted items of furniture to people in need was conceived. 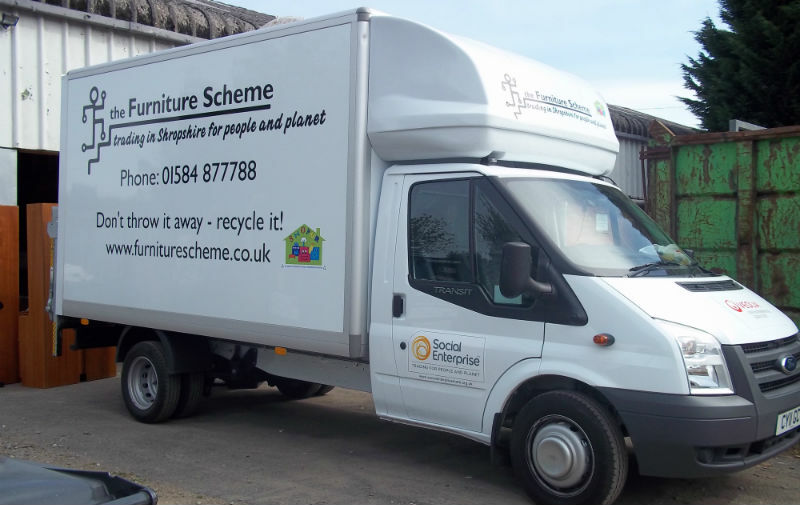 The Furniture Scheme (TFS) accepts donations of furniture and household goods and then recycles or repairs them before passing them on to those in need or selling them to raise much needed funds at one of their shops. The Furniture Scheme runs the Warehouse on Weeping Cross Lane and Renaissance on Tower Street in Ludlow. More recently TFS took over the Charity Bookshop in Craven Arms with book sales from there and the Book Room at Renaissance now accounting for 25% of all retail sales. The Furniture Scheme also manages Rockspring Community Centre Ludlow and CasCA at Craven Arms. Over the years The Furniture Scheme has welcomed hundreds of volunteers, who support the small staff team and are critical to the smooth running of the operations. TFS offers training and work placements to those seeking to increase their skills and experience and in the last 12 months 23 local people have secured employment as a direct result of their time with the Furniture Scheme. Times are increasingly tough for local charities, the need is as great as ever but the economic climate and reducing public sector funding means charities are having to work harder than ever to continue to support local people.